More than just the greatest pure hitter in baseball, Ted Williams stands as a legendary iconic figure and great American hero (both as a ballplayer and WWII fighter pilot) whose complex and multi-faceted personality continues to be source of fascination generation after generation. Williams’ feats and accomplishments as a hitter are multitude – including six American League batting titles, two Triple Crown awards, 521 home runs and 1,839 RBI, and would have compiled more if not for serving with distinction in the military for three years during the prime of his career. Williams has to be included in any discussion concerning the greatest player of all-time. Williams is the last man to hit .400 in a season and the player with the 7th highest lifetime batting average (everyone in front of him played in earlier eras). In his second-to-last full season with the Red Sox in 1959, Williams’ was coming off consecutive batting titles, even at the ages of 38 and 39 respectively. Although Williams didn’t produce “Williams’” type numbers that season in 1959, he was still selected to his 16th All-Star team at the age of 40 and struck out only 27 times in 331 plate appearances. Goldin Auctions is proud to present a Ted Williams Red Sox home uniform consisting of a jersey, pants and two-colored long sleeve undershirt. 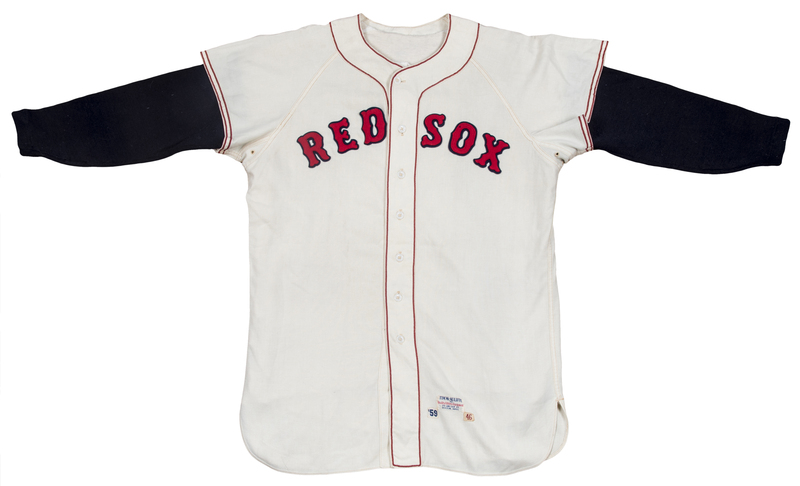 With a Mears grading of A10, this fantastic offered cream-colored home flannel button-down Boston Red Sox jersey was worn by Williams during the 1959 season and may very well be the finest available Williams’ home jersey known to exist and be offered at auction. 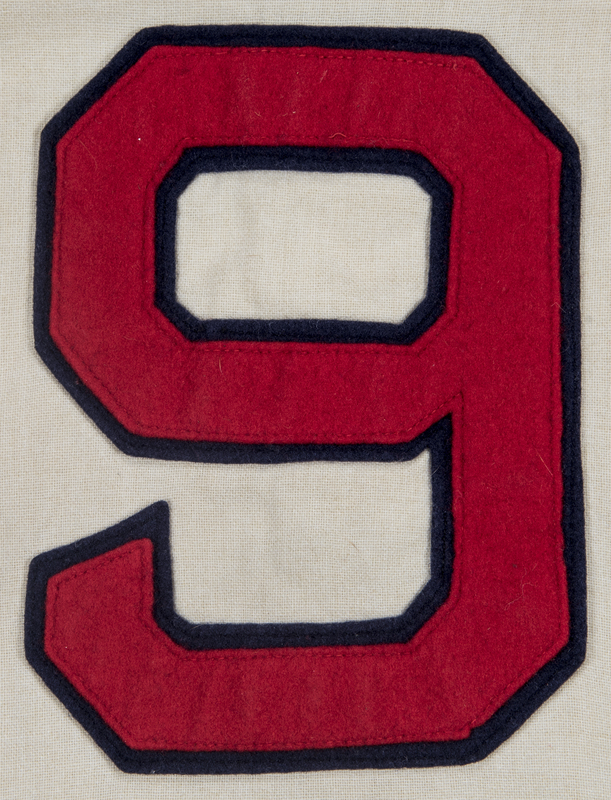 Williams’ familiar number “9” is prominently appliqued in red and navy heavy felt in the McAuliffe number style on the jerseys’ back with “RED SOX” running across the front. 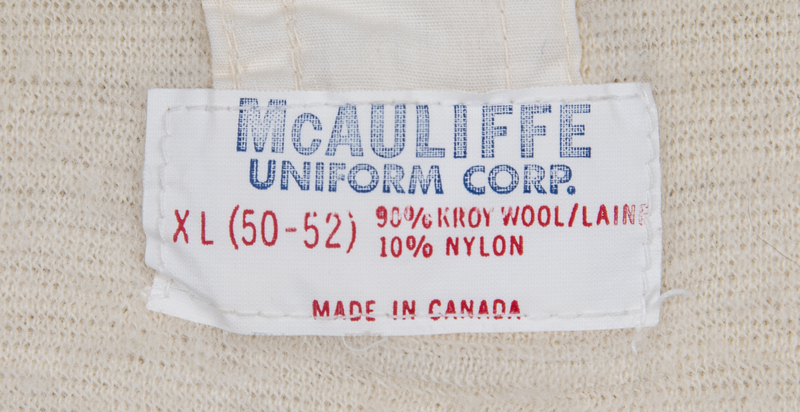 A "Tim McAuliffe" manufacturer’s label is sewn onto the bottom left front tail with a " ‘59" patch indicating the year, and "46" patch indicating the size. Both sides of this classic period wool flannel jersey, with ventilated sleeves, reveal light to moderate game use and consistent game wear. The collar, placket and sleeve ends are trimmed with narrow red soutache and the sleeves are Raglan style cut to a length of two inches. Goldin Auctions previously sold a 1959 Ted Williams Mears A10 road jersey for $144,000 and this offered jersey is also a perfect A10 grade from the same jersey experts at Mears that includes an official authentication worksheet and corresponding LOA. 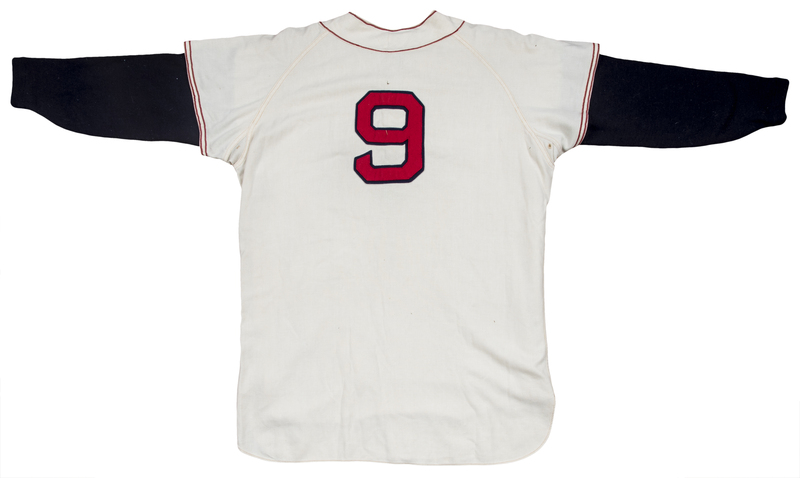 Only a handful of Williams’ home Red Sox jerseys have ever hit the market and this impeccable jersey has the highest grade possible. 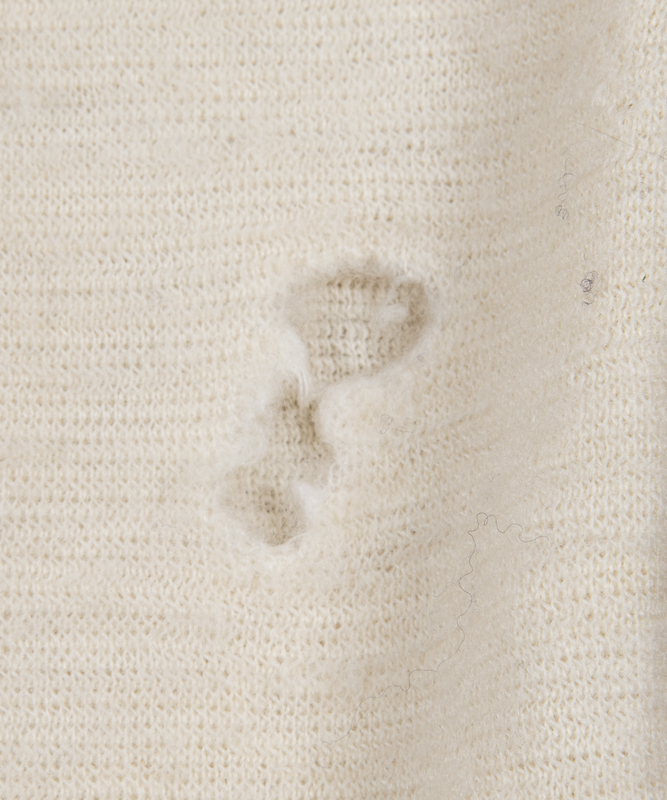 The offered flannel pants are a matching cream color with narrow red soutache down each outside of the leg. 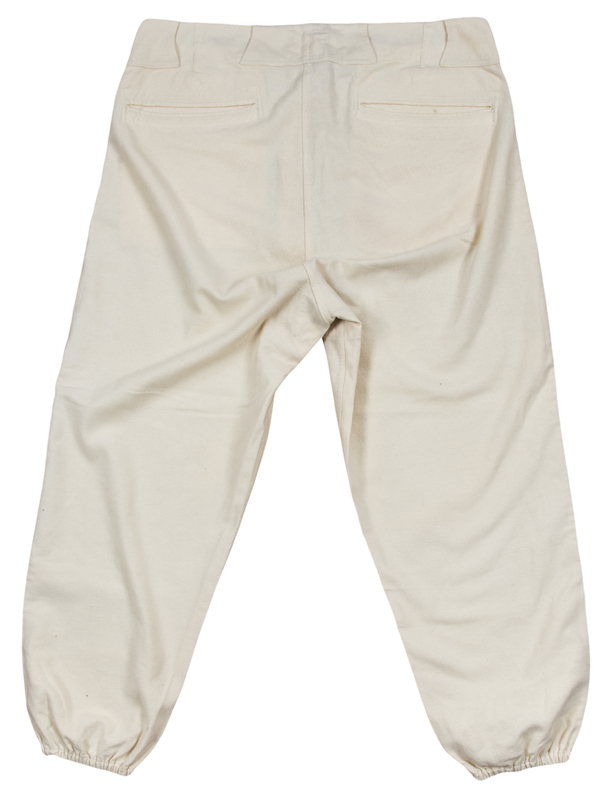 The back of the pants has pockets on each side and with matching cream-colored belt loops with a button on the top and an eight-inch zipper front. 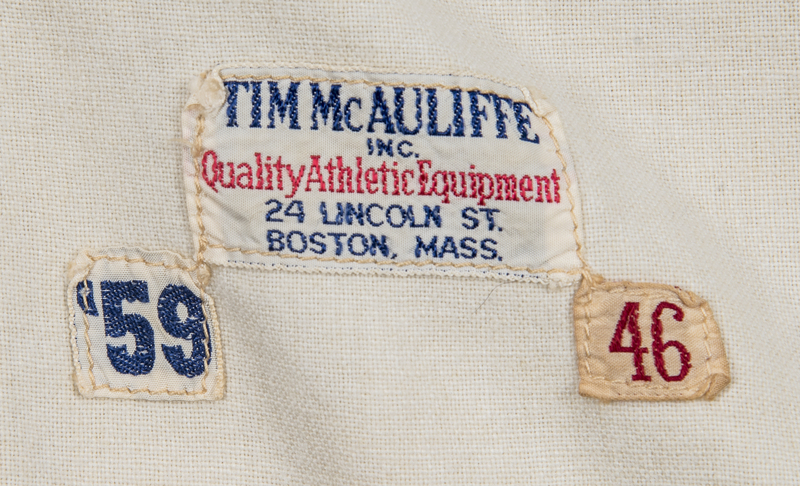 On the inside back waistband is the “Tim McAuliffe Inc” patch with an additional “ ‘59” patch and embroidered in red is “Ted Williams” on the left side and “38 29”. 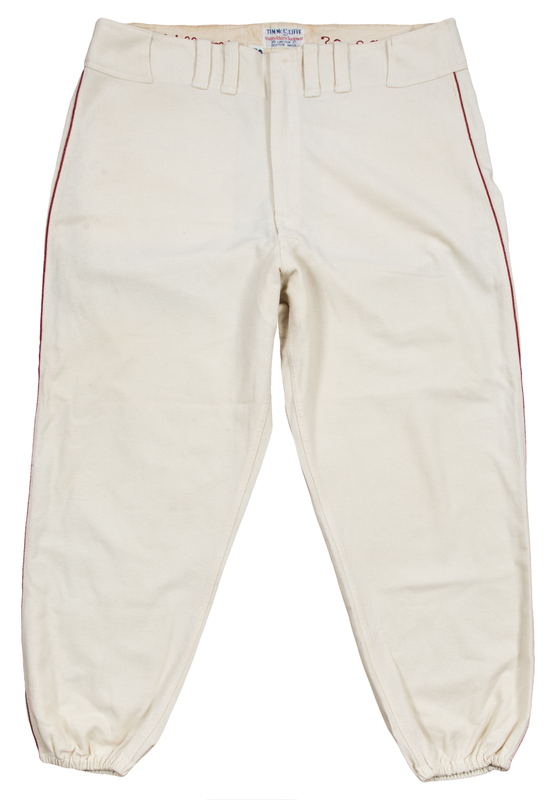 The pants show light use, are in excellent condition and match perfectly to the jersey. 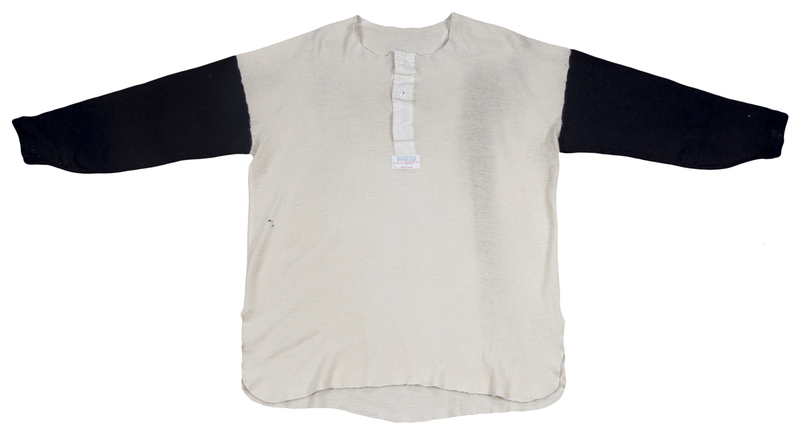 The final item in this extraordinary lot is an authentic undershirt worn by Williams. This size XL (50-52) wool shirt has an off-white torso and navy blue sleeves. The front has three buttons from the top with a “McAuliffe” patch at the base of the buttons. 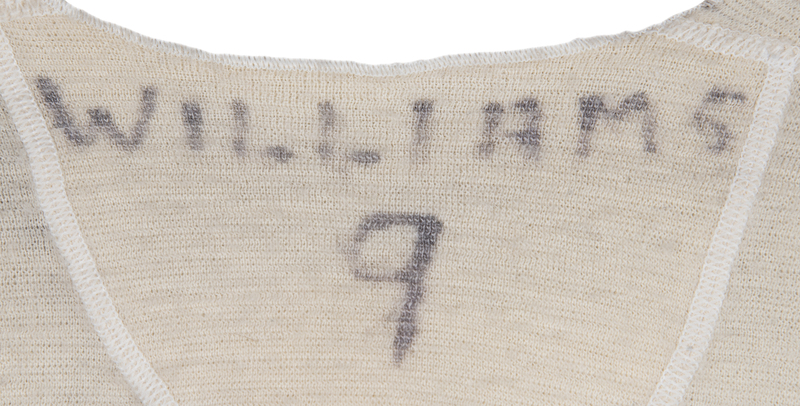 The neck is rounded and on the back on the upper neck is handwritten in black marker “WILLIAMS 9”. This shirt displays light use and has a couple of holes. 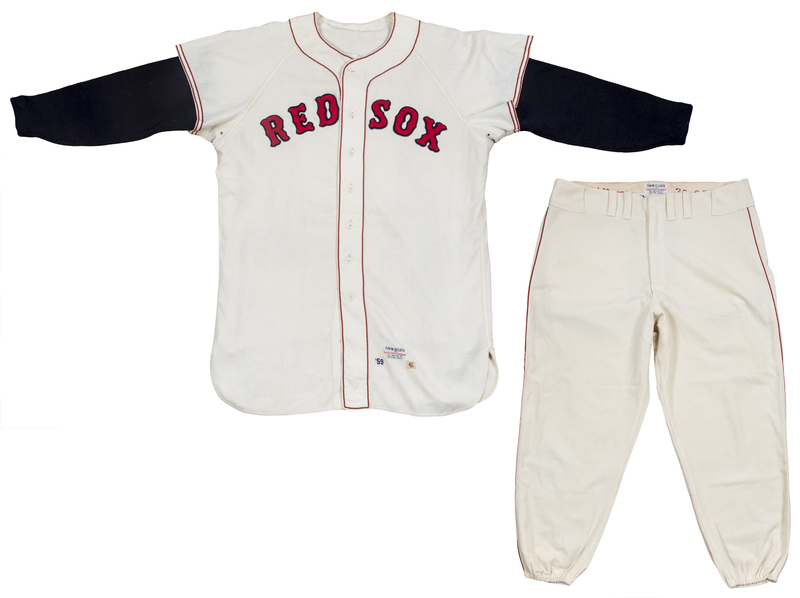 Both the pants and the undershirt have been authenticated by Mears and have been graded as “AUTHENTIC”.